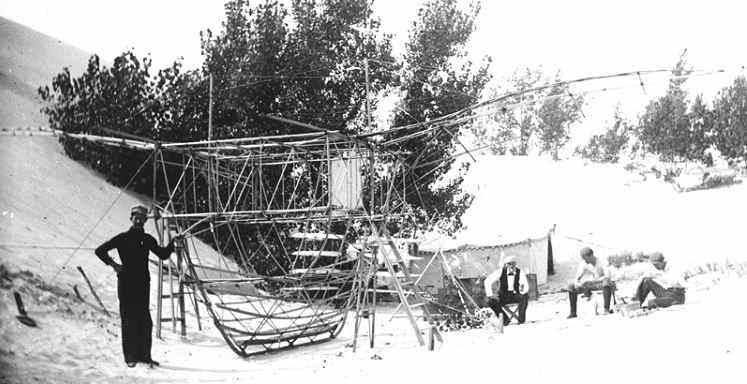 William Paul poses with his 'Albatross' at the second camp of 1896. Seated on the right are Chanute, Herring and William Avery. This great picture is courtesy of the Library of Congress and Ms. Simine Short. 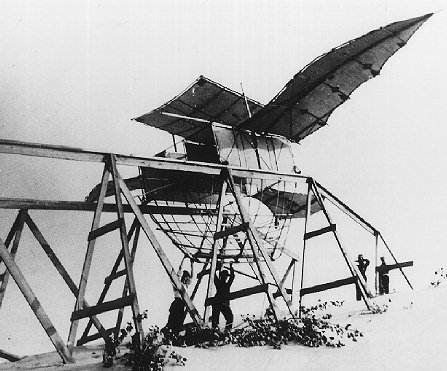 William Paul Butusov's glider, tested at the Dune Park location in September of 1896, attracted more attention than any other experiment in the dunes that summer. (See the list of newspaper articles below.) 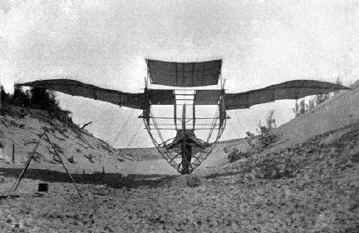 No doubt because of it's ambitious size and elaborate launching pad, this was a better story to most of the reporters than the simple 16 foot two-surfaced glider that was to have much more impact on the history of aviation. 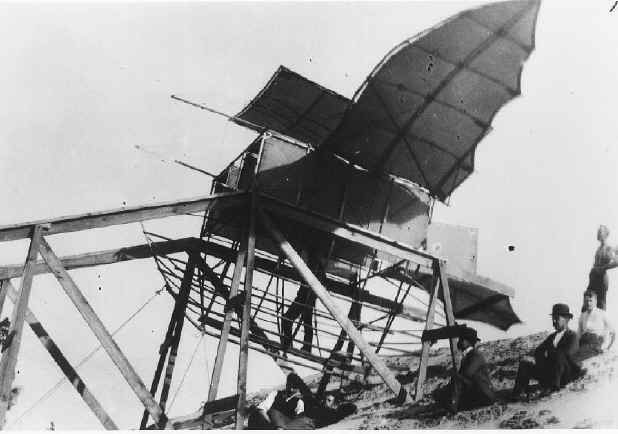 William Paul applied for a patent on his machine on July 16, 1896 with the declaration that "The object of my invention is to provide a machine for sailing or soaring in the air of a simple, strong, light and durable construction, capable of being perfectly balanced and controlled at all times, and which can be operated with safety and ease, having but few moveable parts or devices requiring manipulation." Also from the patent is a description of how the machine works: "The steering or guiding of the machine up or down or so as to cause it to ascend or descend, as may be required from time to time, is effected by the operator moving or leaning his body forward or back, so as to change the angle of incidence of the kite or plane to the wind and that of the wings to the wind." (Both quotes from the specification forming part of Letters Patent No. 606,187, dated June 28, 1898; US Patent Office. Chicago Tribune of September 12, 1896 - no description but a neat sketch.